Hi! 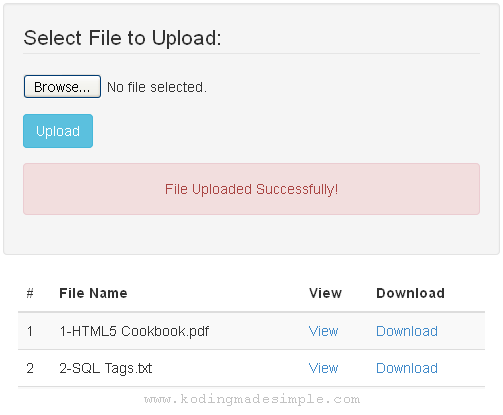 In this tutorial let me show you about upload, view and download file in php and mysql. The file uploading process is similar to what we have discussed here, but this php script not only uploads file to the server but also stores the file path and its created date in mysql database. Apart from uploading file, it also gives you the option to view file on browser and download it from server. With PHP you can practically upload any type of files and the file uploading script I have shared below will work for all file types like PDF, Document, Images, MP3, Videos, Zip archives etc. Just include those file extensions in the filtering process ($allowed array) and you will be able to upload them. How to Upload, View & Download File in PHP & MySQL? Let's move on to the coding part. First you should create mysql database to store file details. Next is the database connectivity script that establishes connection to mysql database from php. Then create index.php - this is the main file containing user interface. It has an upload form and a html table to display the list of uploaded files from database along with 'View' & 'Download' links for them. Note: This demo uses twitter bootstrap for css stylesheet. 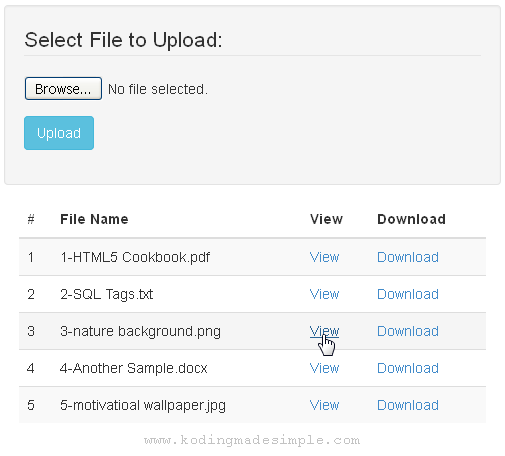 Running index.php will generate a page with upload form and table with files details similar to this. Users can either click on 'View' link to view the files on browser or on 'Download' to download the files from server. 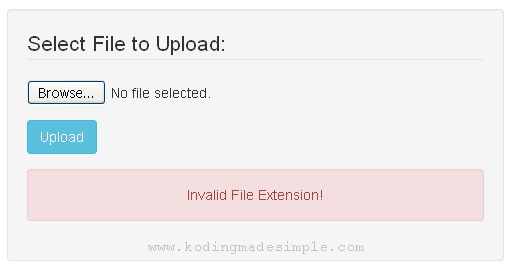 Finally there is 'uploads.php' file which will be executed when the form is submitted to upload the selected file. Here is where we actually upload the file to the server from the client machine and save its name and uploaded date into the database. This script upload file from local machine to server and stores its details into database and redirects to index.php. If everything goes right you will be able to see success message on completion. If there's any error you will be notified about it. So we have seen about file upload and to view and download them using php and mysql database. If you want you can set the file size limit or restrict users to upload only pdf or images etc. No file are inserted into the database. It won't store file in db. Only reference to the file path and file creation time. File will be uploaded to 'uploads' directory on the server. You need to create 'uploads' folder in your application root before running the script. HOW can i use this code in codeigniter? Well! Here are the two ci tutorials you can try with. First one deals with displaying db data in a html table and the other one for uploading files in ci. You have to mix the logic. Please make sure the file name is stored in db. The data is pulled off from the database and displayed. why downloaded files r empty? it show me " Warning: mysqli_fetch_array() expects parameter 1 to be mysqli_result, boolean given in C:\wamp64\www\FTP\index.php on line 61 ". How can i solve it? hello. How can i modify the code to upload and download mp3 and mp4 files? What about the view and download?? Very helpful! ty..But how to delete those upload files using button? Any helpful code I can use? I can't view the download? Files are successfully uploaded on directory path given but how i want to view and download it?